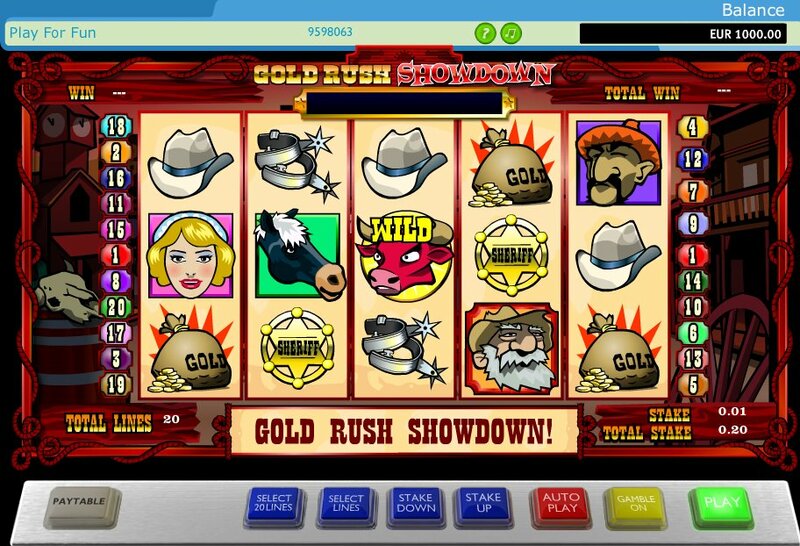 The American Wild West always seems to offer a rich vein of inspiration for slots developers, and games can come in either rich, 3D animation (Betsoft Gaming’s American-themed The True Sheriff) or something a little simpler (Play'n Go’s no-nonsense action slot, Gunslinger). 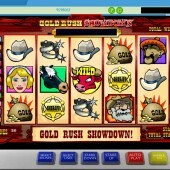 Online slot developer Ash Gaming’s offering to the pile is Gold Rush Showdown, a 5-reel, 20-payline video slot which is packed with iconic images from the era: a sheriff’s badge, an old gold prospector, a dame, a bag of gold, a pair of pistols, spurs, a horse, a Mexican bandit and a cowboy hat. I was half expecting John Wayne to strut onto the screen at some point telling me to get on my horse and drink my milk! The Wild red bull substitutes for all symbols other than the Scatters. Not only that, but five Wilds across the reels pays a 10,000x line bet jackpot. Three or more Prospector Scatters across the reels will award a special jackpot and also a little Pick ’em Bonus. Simply select areas on the map for our plucky prospector to dig in (anything from three to five dig sites) and win cash (or nada) for each site he digs in. But it’s the Cowboy and Bandit icons you need to pay close attention to. Hit the Cowboy anywhere on Reel 1, and the Bandit on Reels 2-5, and you’ll trigger a shootout between the rivals. Either manually shoot the baddies or let the computer do it for you: for each bandit that drops you’ll be awarded cash. It's a nice little arcade-style action to bump up the action. When the Bandit King appears and he’s shot down you’ll be awarded all his loot. If he happens to drop three glistening diamonds, however, you’ll bag the game’s Progressive Jackpot. It’s hard to argue against an online slot that has two interesting bonus features and a progressive jackpot. But that’s what you get with Gold Rush Showdown. The style is a little on the Vegas-casino tip, but that’s no bad thing – revel in a neat shootout bonus feature and go for the Progressive while you’re at it!